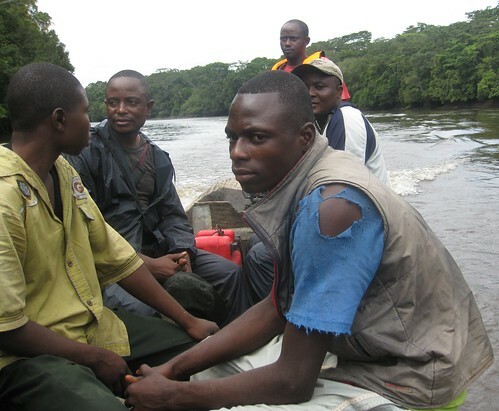 Searching for Bonobo in Congo » Can a Hunter Change Professions at Kindu’s School for the Deaf? The Mbuti-pygmies are a forest people and hunters who move around the forest attuned to sound. Their musical calls locate them through vast blind landscapes of trees. Their evening-song unites them in a fire-lit opening in a vast swaddle of trees. 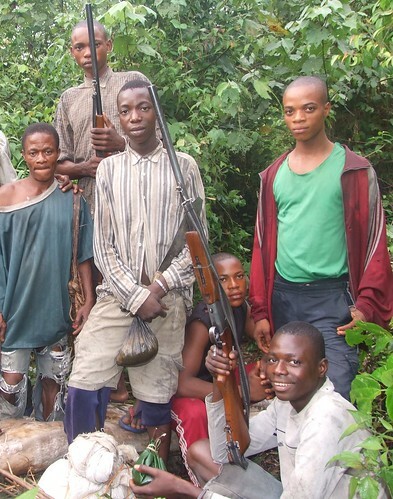 Okonde in a hunting party. He is on the bottom right. 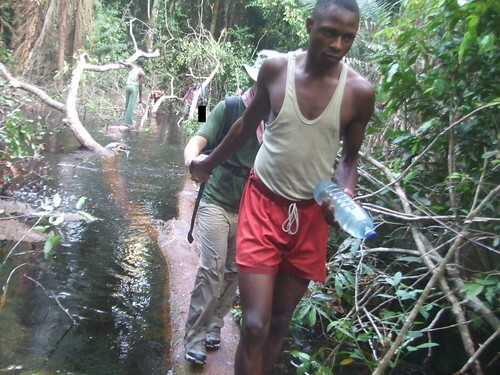 Okonde Salumu, too, is a forest hunter, but he is deaf. He is not Mbuti, but one of the Bantu forest dwellers of Maniema. 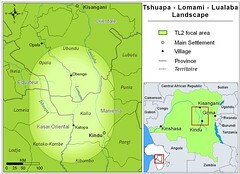 John pointed out to me that in the single small village of Tshombe Kilima there are four deaf children. In-breeding among the Bangengele?, he mused. Okonde is not just a hunter; he is a very good hunter. When he first started helping the TL2 teams as a porter across the forest and savanna to reach the Lomami River, he would point out places in the undergrowth where his snares had caught an antelope. He would give an animated and very screeching rendition of the animal’s struggle. Another of the porters would watch and then tell us which species of antelope had been caught. Okonde helping me through flooded forest. That was two years ago when Okonde was fourteen, now he no longer screeches. He is quiet, attentive. And he is reflective. As a porter he carries the heaviest load, but still he stops to make sure that we cross the water safely or don’t get lost where the path seems to peter out in the re-growth of a treefall. There is a school for the deaf in Kindu. We asked about it, it is good and teaches professions (sewing and carpentry) as well as reading, writing and sign language. Why do we propose this? Okonde watched me reading in camp. I point at the book and I point at him. He holds up his hands to mimic a book , moving his head back and forth for reading. He takes his right hand, holding an imaginary pen, and scrolls across his other hand held studiously still. He is very bright – he would learn quickly. Last November, Okonde crosses the Lomami to camp Katopa in our dugout. 500 USD for one year. This would include school fees for one year, a mattress and sheets to allow him to lodge at the headmaster’s house, and a small monthly addition to the headmaster’s monthly food budget. We will oversee and give updates. Your contributions are welcome and needed. If you are able to, please contribute through our paypal. See in the sidebar. This entry was written by Terese Hart, posted on 2011-04-03 at 9:26 am, filed under uncategorized. Bookmark the permalink. Follow any comments here with the RSS feed for this post. Post a comment or leave a trackback: Trackback URL. I would be delighted to fund this young man for $500. I run a big scholarship fund in Uganda. I love your web site and truth be told have been following you and John for years.. I arrived in Uganda in 1986 when my husband William Park went work at The New Vision. We are friends with Jan, Tom, Ursula and Illy. Elizabeth Ross stays with me in Kampala. Let’s be in touch.